Over time your Selenium Grid might become unstable due to browsers not being closed properly, browser error popups and so on. This blogpost will cover the creation of a disposable Selenium Grid. Since the introduction of Docker the creation of containers (a kind of virtual machine) became a lot easier. With Docker-compose you can even describe your multi-container setup in a recipe-style providing step-by-step procedures. In your script you can use http://[IP]:4444/wd/hub in order to connect to your Selenium Grid. Getting tired of downloading the latest driver into your project? You might want to take a look at gradle-download-task. This plugin allows you to download files (over HTTP and HTTPS) to a specific destination directory. * Import the Download task. This line is optional. * when you specify a task of type 'Download'. I hope this tool is useful for you and additional features can be requested via comments. You might think that protractor is the way to go when testing AngularJS applications… The thing with AngularJS is that you can decide to remove all class and id‘s from the rendered html. (which is good for page rendering times, but bad for testability). In the template files there are some identifiers, but those are not visible in the rendered html, all the webelements with a template identifier have a class with the value ng-binding (or something very similar). We have a very large broad IT-landscape with a big variety of applications. (JSF (JavaServer Faces) websites, AngularJS websites, JMX services, web services (REST and WSDL), mail server integration, PDF reader, FTP, Ora cle DB and perhaps mobile in the future). In this case I decided to write a Java-based test automation solution. Protractor is built on top of WebDriverJS. So, I thought the same actions can be done in Java. I found https://github.com/paul-hammant/ngWebDriver which suits our needs. Don’t forget to set the setScriptTimeout(), otherwise it might not work. Functional test automation is relatively slow and heavy in execution. Selenium scripts, for example, need to launch a browser, open the website and testdata needs to be present. We can speed up testing by running the test scripts in parallel on distributed machines. This incredibly speeds up the in-browser tests and quick and accurate feedback is given. 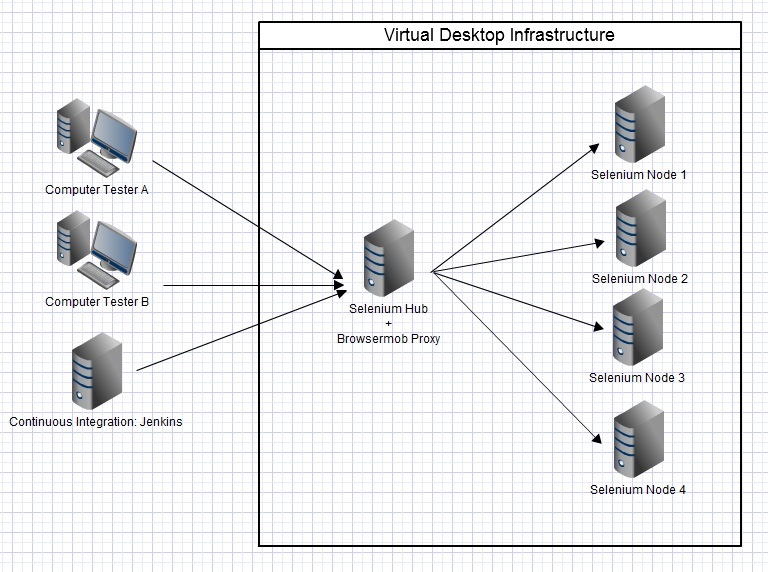 In the time that I worked for Spil Games we decided to set up a Virtual Desktop Infrastructure (VDI) for both manual testing and automated testing. It’s essentially a single blade with 2 x 6 Intel Xeon E5-2630 @ 2.3GHz, 1 TB of solid-state drives (SSD’s) and about 130 GB of memory. The performance was an issue in the past, that’s why we have chosen for solid-state drives (the response of the virtual machine is ‘almost’ instant). Manual testing: We had a pool of pre-configured operating systems and browser versions. The Virtual Desktop Infrastructure will create a virtual machine on demand, every time somebody wants to access a specific machine. It’s made by using VMware View that allows graphics acceleration over the PCoIP (PC-over-IP) protocol which makes it possible to test everything you want to in a browser and it is close to optimal performance. Automated testing: We had a dedicated pool of virtual machines with DHCP reserved IP-addresses with which we can establish a Selenium Grid. We used virtual machines with Windows 7 and 3 GB of memory and all the required browsers installed. Remote test execution of the Selenium scripts is, with the described setup, even faster than execution on the local machine. Sauce Labs: Run automated Selenium tests in the cloud or manually test your site on any browser instantly. Videos, screenshots, and developer tools make debugging a snap. TestingBot: Cross browser testing with Selenium Online. Automatically test your website on various browsers with Selenium. BrowserStack: BrowserStack is a cross-browser testing tool, to test public websites and protected servers, on a cloud infrastructure of desktop and mobile browsers.